WikiLeaks founder Julian Assange refuses to say whether the Russians are behind the Democratic National Committee email hack, though signs point in the direction of a meddling Moscow that might prefer a Trump presidency. The Kremlin has denied the allegations, but whichever agents are behind the attack sound as if they have more catnip for the GOP candidate and many more headaches for Clinton. Assange told CNN in an interview that he had “a lot more material” about the United States election campaign, in addition to the 20,000 DNC emails posted on WikiLeaks that show the Democratic National Committee strongly favored Hillary Clinton as the nominee over Bernie Sanders. 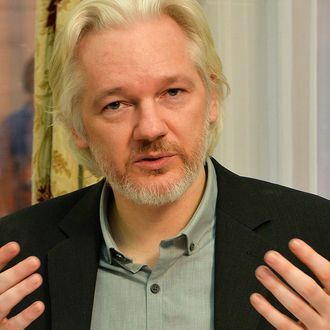 He added that the Clinton campaign’s rush to put the blame on Russia raised “serious questions … about the natural instincts of Clinton that when confronted with a serious domestic political scandal she tries to blame the Russians, blame the Chinese, et cetera,” Assange said. He added that instinct could cause “problems” if she were to take office. Often it’s the case that we have to do a lot of exploration and marketing of the material we publish ourselves to get a big political impact for it. But in this case, we knew, because of the pending DNC, because of the degree of interest in the U.S. election, we didn’t need to establish partnerships with The New York Times or The Washington Post. In fact, that might be counterproductive, because they are partisans of one group or another. The former veep’s non-campaign may continue for a few more days. A comparison to Jeb Bush isn’t the greatest likeness for a Democratic candidate who’s currently polling at 2 percent. Will Elizabeth Warren’s college debt plan become a model for other Democrats? Today, Elizabeth Warren unveiled a comprehensive proposal to forgive millions of Americans’ student debt. What stands out to you about her plan that makes it differ from others we’ve seen in the past? Have we seen a lot of mainstream proposals to cancel student debt? Bernie Sanders linked free public college to student loan refinancing, but his College for All Act didn’t go as far as Warren’s proposal. Yeah, the free college idea has more precedent. So this is all pretty much new. I’d say so. Because her proposal didn’t just lay out free public college or cancel (a lot of) student loan debt, it also laid several specific policies to address racial inequities in higher education. So she quite explicitly linked wealth redistribution to racial justice. One thing I find attractive about Warren’s general approach to policy is how clearly it identifies a problem and sets about fixing it in specific ways. It’s wonky, but in a way that’s direct and connected to real problems. She’s been the best at that by far. Not sure it’s going to work (electorally), and I don’t always agree with the approach, but I do like it. She’s proving that it is possible to introduce left-wing policy in a detailed but easily digestible way, and i think that detail is an area where Sanders has failed in the past. The conservative writer Philiip Klein draw plenty of online scorn for writing that “Elizabeth Warren’s plan to cancel student loan debt would be a slap in the face to all those who struggled to pay off their loans.” But it’s easy to imagine that line of criticism being at least somewhat effective in real life, if this proposal was ever actually considered in Congress. Republican will say: the debtors in question knew what they were getting into, and now the government is bailing them out through higher taxes (albeit only on the wealthy). Do you think most Americans would be on board with Warren’s proposal, or some version of it? I actually don’t really have a great idea – I suspect not. it’s an easy policy to demagogue against. Just wheel out the “gender studies” major with wealthy parents who works for a NYC media company. Pretty unsympathetic! Is this a subtweet about someone we work with? I do think that the average parent is going to be receptive to policy that helps relieve the student debt burdens that their children might otherwise bear, and I think it’ll resonate with young voters, too. I think another line of easy attack would be something like: what about people who didn’t go to college, aka the majority of thei country? Where’s their bailout? Etc. etc. Right, I think an attack will be mounted on lines that are at least facially about class. She can pretty easily point to the other redistributive policies that she’s introduced. And then there’s the fact that Warren’s plan is tied to racial justice in higher education – it’s pretty easy to imagine the demagoguery around that. It’s definitely going to happen. How well it will work is sort of an open question. My belief is that there are lots of racist Democrats, but that’s sort of a side issue. The polling that we have on free college, I think, shows it to be a relatively popular policy on its own. I don’t know what the effect of loan forgiveness will be on that. I’m curious to see what the conservative counter on a policy level would be (if any). I can imagine Congressional Republicans pitching something to make student loan debt more like other kinds of debt. Warren has become the undisputed policy leader of this primary, even as she struggles in the polls. Do you see other major contenders glomming on to this proposal, or putting forward a student debt plan of their own? Will this become a major issue in the campaign? I think it’s going to be a side concern compared with Medicare for all and income inequality more broadly. I’m curious about whether this will inspire Democrats to think about debt forgiveness in other arenas, now or in the future. What did you have in mind, your gambling debts? I’m up to my ears — the loan sharks are after me. I’m sorry you picked the Washington Generals again. it does seem that these questions will become more and more prominent as a generation saddled with debt gains political power over the coming years. In an increasing number of countries, particularly in Asia, Christians face challenges a lot more stressful than “Happy Holidays” greetings. In the days leading up to the devastating suicide attacks that killed nearly 300 people in Sri Lanka on Easter Sunday, the country’s security agencies had been closely watching a secretive cell of the National Thowheeth Jama’ath, a little-known radical Islamist organization that security officials in Sri Lanka now say carried out the attacks. The security agencies had even been given specific intelligence on April 11 that the group, also known by the spelling National Thowheed Jama’ath, was planning to bomb Catholic churches. India appeared to have shared warnings with them about the group more than a week before then. Within hours of when three churches and three hotels were bombed, Sri Lankan security services seized at least 24 suspects, implying that they knew exactly where this group had been operating and were quickly able to locate its safe houses. In between games of “Be Best” hopscotch and the namesake event at the White House’s Easter egg roll, a child apparently couldn’t pass up the chance to press President Donald Trump on one of his signature campaign promises. As he colored cards for service members on the White House’s South Lawn, Trump responded to a question from one of the children alongside him. “He’s going to be a conservative someday!” Trump continued. Stephen Moore, an economic commentator and former Trump campaign adviser, made those and similar comments in several columns reviewed by CNN’s KFile that were published on the website of the conservative National Review magazine in 2001, twice in 2002 and 2003. Caution on impeachment makes sense. It is a monumental step that would shape politics in unforeseen and potentially negative ways. But inaction, or even just ordinary action, has risks too. Trump will continue try to shape the post-Mueller narrative to his advantage, condemning the investigation as a “witch hunt” from its origin to its conclusion. His allies will do the same. Even if they fail to persuade the public, they can muddy the waters and turn this constitutional conflict into another case of partisan bickering. Democrats still have to defeat Trump at the ballot box, which means building a mass coalition against his politics. At worst, impeachment could crowd out the material case against Trump, centering the election on legal questions versus the impact of his presidency on people’s lives. But there’s another possibility: that impeachment helps Democrats make a truly comprehensive case against the president, uniting his corruption, his criminality and his contempt for ordinary Americans under a single narrative. One woman said she was told to take a sick leave despite being perfectly healthy. Outbreaks in New York state continue to drive up the number of U.S. measles cases, which are approaching levels not seen in 25 years. Health officials say 71 more cases were reported last week, with 68 of them from New York. That brings this year’s total to 626. The Centers for Disease Control and Prevention released the latest numbers Monday. “No more women refs, no women announcers, no women beer vendors, no women anything,” he wrote. Warren’s sweeping plan to cancel tens of millions of Americans’ student loan debt sets a radically progressive standard for the 2020 field. Two employee activists at Google say they have been retaliated against for helping to organize a walkout among thousands of Google employees in November, and are planning a “town hall” meeting on Friday for others to discuss alleged instances of retaliation. Rage Drove the Google Walkout. Can It Bring About Real Change at Tech Companies? Cain pushed back against Senate hostility to his Fed ambitions, but his baggage proved to be all too much. SCOTUS will clarify whether federal laws offer broad protections to LGBTQ employees. Kavanaugh’s presence on the Court creates grounds for pessimism. “Nobody disobeys my orders,” President Trump tells me when I asked about the portrayal in the Mueller report that his staff often ignored his directives. The Mueller report shows Trump repeatedly put defending his own legitimacy ahead of his duty to defend U.S. national security and election integrity. My friend Herman Cain, a truly wonderful man, has asked me not to nominate him for a seat on the Federal Reserve Board. I will respect his wishes. Herman is a great American who truly loves our Country! A guide to everyone hoping to take on Trump, from Cory Booker to Andrew Yang — and those, like Oprah, who are sitting this one out. It is the political scientist’s job to accurately describe the marginal Trump voter’s motives. The politician’s job is to change them. Those around the president say he’s been of two minds when the topic of facing Sanders in 2020 comes up. While he sees the senator as a vulnerable opponent, he also has offered begrudging respect for his political acumen. Trump will—sometimes unprompted—bring up Sanders’ own working-class support, and acknowledge that there is, in fact, potential for the senator to win over Trump voters with his populist appeal, three sources who’ve discussed this with the president tell The Daily Beast. The president has been impressed with Sanders’ ability to ignite his base and draw a large crowd, though not, in his words, as “good as Trump.” The president has also privately discussed the fundraising hauls that Sanders and his campaign have pulled off, noting Sanders’ impressive track record with small-dollar donors. U.S. President Donald Trump on Monday sued to block a subpoena issued by the Democratic chairman of the U.S. House Oversight Committee that sought information about his personal and business finances. The subpoena sought eight years of documents from Trump and several of his businesses, lawyers for Trump and the Trump Organization said in a court filing.